Host – usually runs on physical hardware, lower level. Guest – runs on the virtual/virtualized environment, upper level. Full virtualization – virtualize all the devices! Can run almost all the operating systems without any modifications. Slower than Paravirtualization and Operating-system-level virtualization. Need to do some jobs like binary translation or software instruction decode, will have a heavy overhead, is very inefficiet. 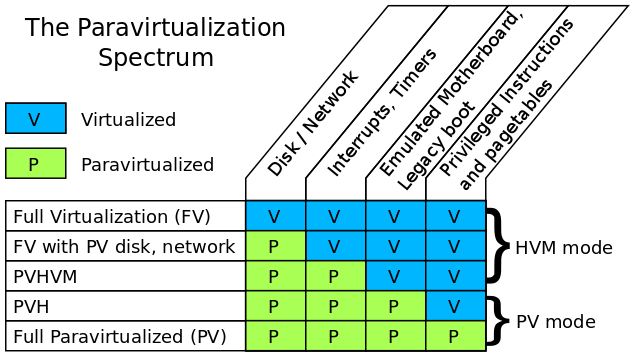 Full virtualization with paravirtualization drivers. Guest knows it’s a guest on the host, the guest will communicate with hypervisor. Use hypercall (call to hypervisor) as its system call. Hard(almost impossible) to modify the kernel of closed-source operating systems like Windows to use this method. Faster than full virtualization but slower than operating-system-level virtualization. Using help from hardware capabilities. Isolate different user space instances. The section of partial virtualization on wikipedia said that “This section does not cite any references or sources”. Runs directly on the real hareware, directly control the hardware resources. Runs on an existing operating system. Still learning, hope that there are not too many wrong things here … comments to point out mistakes/weak points are welcome!